Learn to build the best service team with the Service Analytics guide. This guide is your handbook to the app that delivers a new level of insight directly to any device. With Service Analytics, service leaders can get instant updates on net promoter scores, service level agreements, case volume, and trends across all channels. And agents get a deeper understanding of customer and case context, so they can deliver the right service on the right channel at the right time. 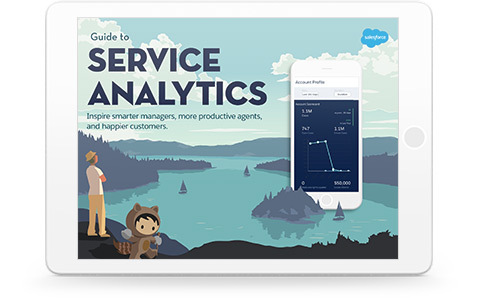 Download the e-book to see how Einstein Service Analytics can help every service employee, at every level, get a full view of their cases, their customers, and their business.